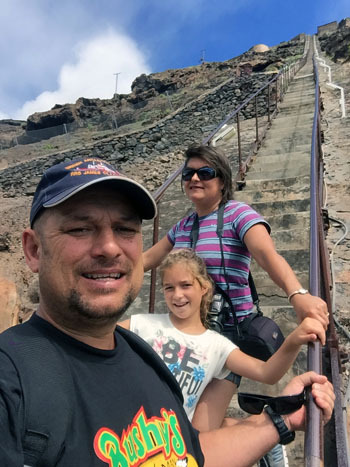 Over the last three months myself and my family have been undertaking a work placement on St Helena. We arrived on 6th April 2018 on board the RRS James Clark Ross and it was very surreal arriving in Jamestown harbour after last visiting almost 30 years ago. I spent two years from 1992 - 1994 as a student at Prince Andrew school and Robin a year in 1987 as a trainee electrician. This is our daughter Amber's first visit to St Helena but she has always heard us talk about our sister island and the time we spent there. Our trip on the James Clark Ross was wonderful and being a research ship we had a very interesting five days, finding out about all the scientific discoveries, being shown around the ship, and bird and whale watching. The Captain, scientists and crew were all so welcoming and made us feel very much at home, we thank them for such a lovely trip. While on St Helena we lived in a lovely flat at the Briars which is quite close to Jamestown. It was great meeting up with old friends and we have made many new friends on the way as well. 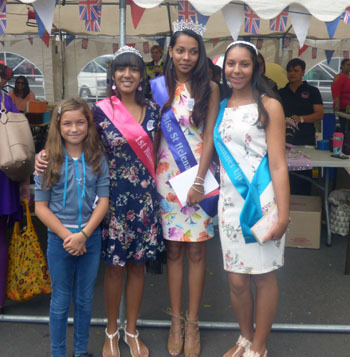 St Helena is a very special place and it was so nice to be back. When we were here in the late 80’s and early 90’s they were just talking about an airport, now in 2018 it has finally been built. Amber feeding Jonathan in the grounds of Plantation House on 3rd May. 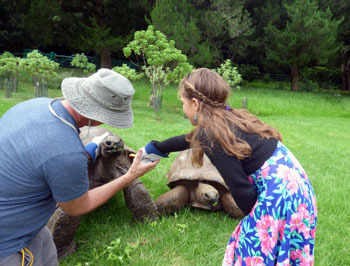 Jonathan is a Seychelles gaint tortoise, brought as a mature adult to St Helena in 1882. Mature adults are 50+ years old and so Jonathan, at 186 years old in 2018 in the oldest currently living land animal on earth. Right: On Sports Day held on 30th May. While here I was fortunate to spend some time with the Tourism Department, G Uniques, The Museum, The Archives, Solomons Bakery and SHAPE. I was very inspired by SHAPE and what it stands for, so if anyone plans to visit St Helena don’t forget to pay a visit to SHAPE or contact them to find out more on SHAPE@helanta.co.sh. 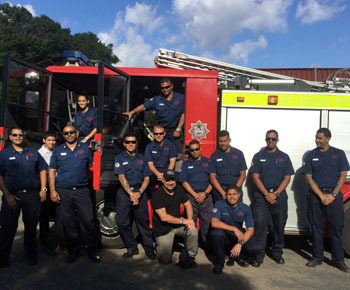 Robin was based with Connect, the Fire Department, electrical work under the private electrical sector, Waste Management and Solomons Electrical and Refridgeration section. It was great to see how another island functions and to see all their challenges. Although I came up with many ideas from this experience the main areas I would like to take forward once back on Tristan is to introduce some postbox walks, marketing of our handmade jewellery, flax products and recyclable items made from used paper and cardboard. Robin would like to concentrate on fire systems, health and safety practices and renewable energy. 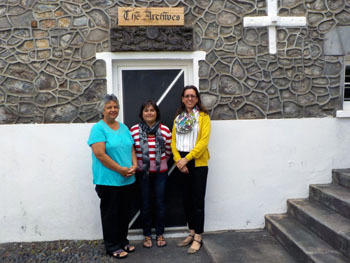 We have been very inspired by our time here on St Helena and all departments have been so accommodating and staff members so kind assisting us in observing all the areas we were interested in. 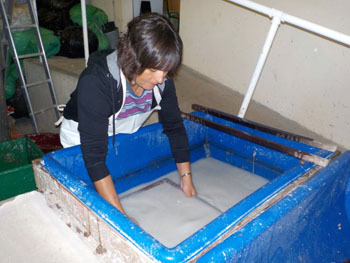 Dawn making paper at the SHAPE Recycling Centre on 9th July. 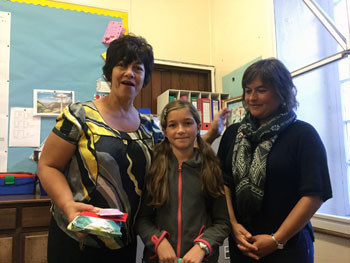 Amber attended Pilling School in Jamestown and was very happy there. She quickly made new friends and all the teachers were so lovely. 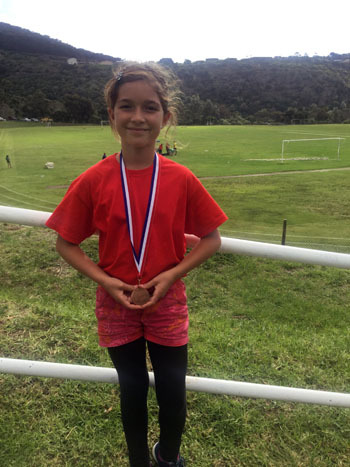 Amber was able to take part in the annual sports day where she won a medal for the relay race and was also awarded a certificate for creative writing, which will be such lovely memories to take home with her. 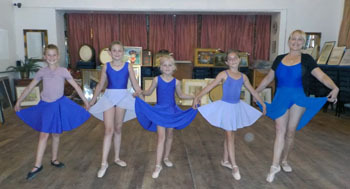 Amber also took part in weekly after school ballet classes which she thoroughly enjoyed. 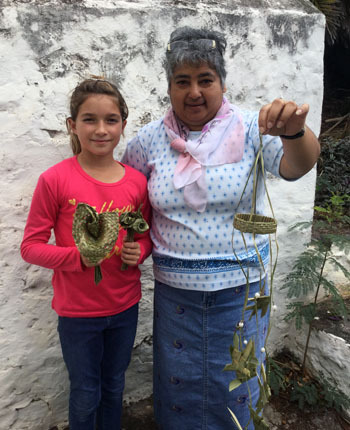 She spent a lovely day with Wonda at Abiwans seeing how flax products are made, and I hope she can take this skill home and show her school friends. 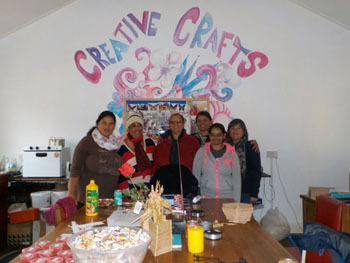 Living on a remote island it is so important to make handmade products out of material readily available. who also taught Dawn (right) in 1992. During the weekends we took the opportunity to go on postbox walks, climb Jacobs Ladder and see the many beautiful sites of St Helena, and also enjoy the night life. 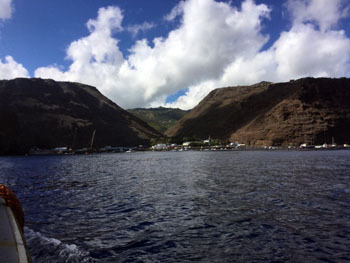 St Helena truly is a magical place and weather is most definitely the best. We would like to say a big thank you to all our friends and especially our family Keith, Maria Yon and families and Jane and Jeffrey Augustus who has made our stay so memorable. Not sure if we will ever be back again, but I do hope that further training on St Helena for Tristanians will be sought. It’s a great way to keep the link with our sister island now that the RMS St Helena will not be calling at Tristan any more. We leave here with heavy hearts but at the same time there is much excitement as our journey has not ended yet. Before returning to Tristan in September we will be taking a short holiday to visit our family and friends in the UK, especially our daughter Jade who is presently studying for her A Levels there. 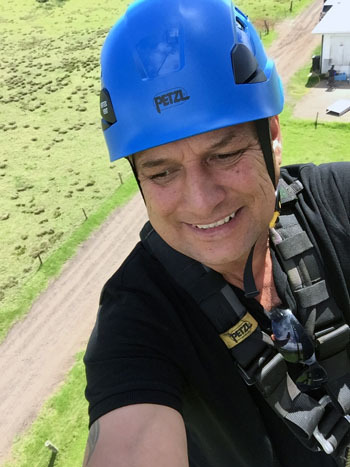 We will also take the opportunity to visit France and the EnviroEarth company, and then the Birdfair in London to see if we can promote the island to tour operators, cruise companies and people in general.